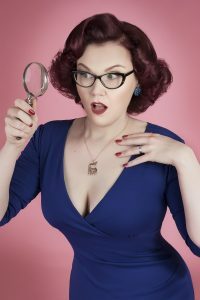 In the past few years I have had the distinct pleasure of collaborating with not one but two talented artists – each very much with their own artistic style and technique – to reconstruct what Early Iron Age elites and their grave goods may have looked like in life. These experiences not only resulted in fantastic paintings that help visualize and convey the past, working with these artists helped me see the material I was studying in new light (thanks to their ‘artistic eye’) and challenged me to think about things I had not considered (for example how exactly a certain piece of horse-gear could have attached to leather reins). Here I share my experiences and the results and highly recommend you go give these creative souls some love! 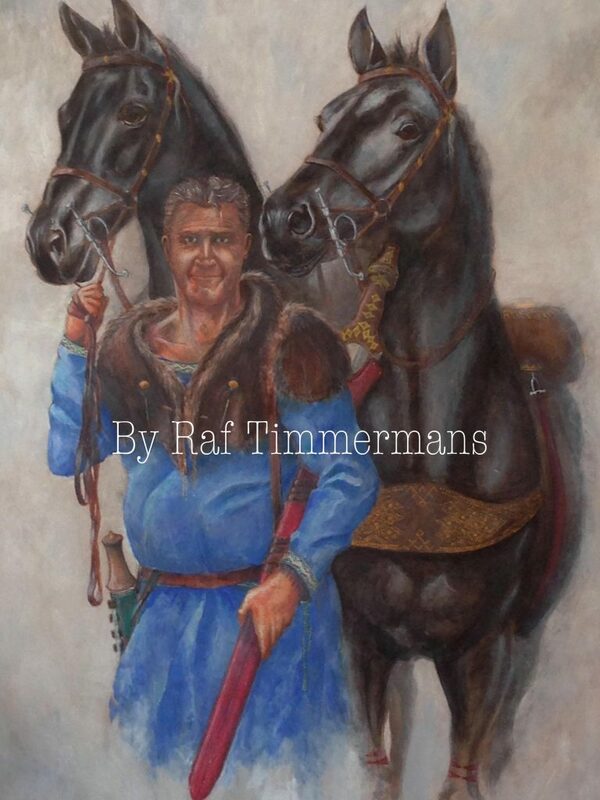 My first artistic collaboration came around when Richard Jansen, the municipal archeologist of Oss and my office mate at the Faculty of Archaeology in Leiden, wanted a new reconstruction of the Chieftain of Oss as he appeared in life that reflected the latest discoveries to present as part of the festivities surrounding the opening of the Paalgraven monument. For while others have created reconstructions of the Oss Chieftain – for example Kelvin Wilson who created a beautiful drawing of the Oss Chieftain – our understanding of the Oss Chieftain and his spectacular grave goods has increased dramatically in the last decade, and we now wanted a painting that reflected this. Having worked with archeological illustrator Raf TImmermans before we approached him and he agreed to take up the challenge! While not a true physical anthropological reconstruction of his face, the Chieftain as he is painted is based on physical anthropological analysis (most recently by Simone Lemmers, but also on earlier work by Liesbeth Smits). Recent analysis determined him to be some 30–40 years old, tall and muscular, but with a relatively gracile face. We wanted this reconstruction to reflect what his grave goods suggested him to be like in life and chose to depict him with his elaborately decked out horses and beautifully decorated sword. Research suggests that the horses who pulled his ceremonial wagon were likely imported along with the horse-gear that they wore and ended up in the Chieftain’s grave – and also that they were likely quite large (see my dissertation). 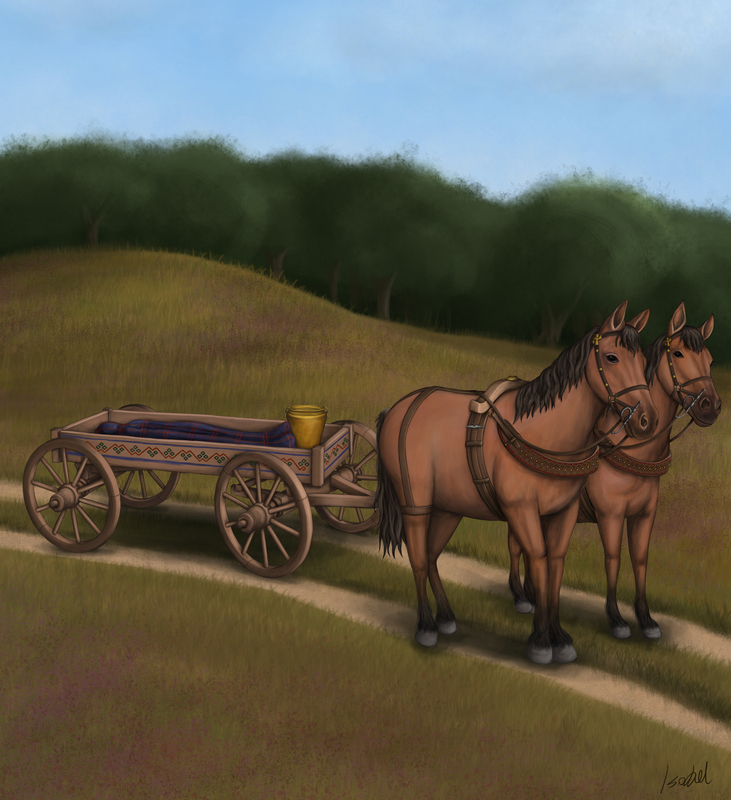 We wanted to convey how impressive these animals (and by extension the man whose wagon they pulled) would have been, and opted to depict them as impressive black stallions – even though this is conjecture – to give them the wow-factor that they likely would have had on the Iron Age inhabitants of the Oss-area. To also properly showcase the impressive length of his imported Mindelheim sword, the Chieftain is carrying it over his shoulder in its scabbard. Given the delicate nature of the decorated hilt and its extreme length it is entirely possible that this sword was never used in proper combat (as the delicate gold inlay would not have survived any rough gripping or handling of it), but it likely was very much a part of and a reflection of the Chieftain’s identity. The resultant painting was unveiled at the opening of the Paalgraven monument, and gave new face to an ancient burial complex. Having recreated what the Chieftain of Oss could have looked like in life, Richard, Raf and I decided that we really also needed a second painting depicting what his funerary urn would have looked like. I have (so far) spent six years researching this Chieftain’s burial, and in that time have collaborated with over a dozen different specialists. By combining their results with my own analysis of surviving grave goods and in particular the restoration report created by Restauratieatelier Restaura during their 1990’s restoration of all the grave goods I was able to reconstruct how objects had corroded together, and reconstruct how (most of) the grave goods would have been positioned within the bronze vessel used as urn (again, see my dissertation). Of particular interest in this was the use of textiles to wrap up a number of grave goods, including the blade of the spectacular sword, which had been carefully bent round during the funerary ritual. This painting also shows one of the more interesting discoveries that we made in the last few years, namely the presence of a packet of exceptional imported textile that had been folded several times and deposited as a grave good in its own right. The exceptional quality of this textile and the skill and time needed to make this very fine diamond twill led textile expert Dr. Karina Grömer to speculate that it may have rivaled the sword in its value. Analysis showed no surviving dyestuff and we do not know what color it originally was, so we elected to make it a vibrant blue cobalt – both because surviving similar textiles in other areas from this time period showed the use of this color and because it still speaks to us 21st century observers as a high-status, ‘royal’ color. 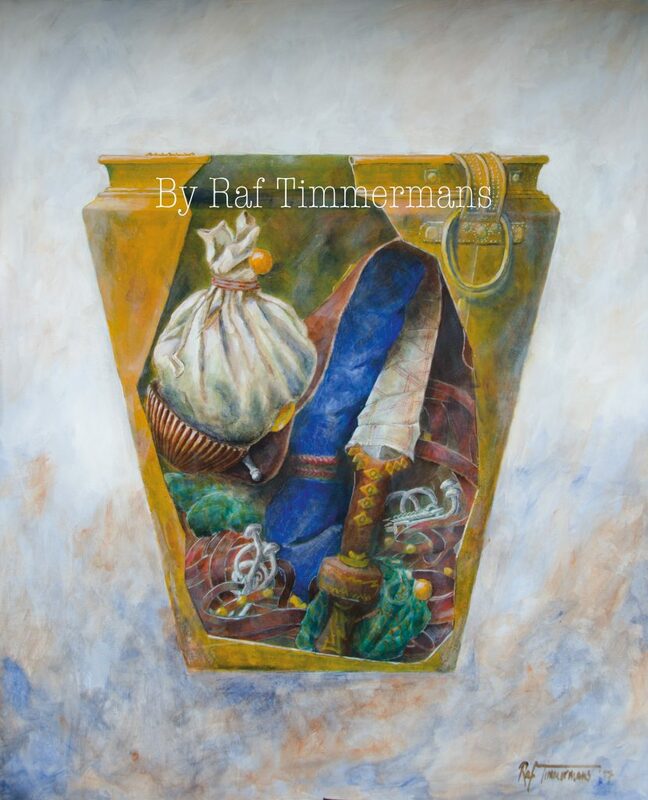 In the resultant painting Raf managed to capture the care taken and the complex funerary urn created during the funerary rite of the Chieftain of Oss. For my second collaboration Isobel (Iz) Gelman offered me a solution to a problem I was having with regards to illustrations I needed for my dissertation. The graves I studied frequently yielded the fragmentary remains of extraordinary and elaborately decorated horse-gear and ceremonial wagons. Due the destructive nature of the burial practice, often all that remained were small fragments which generally were burned, bent and/or broken. Intact parallels found in the Hallstatt Culture of Central Europe offer clues as to how our Low Countries’ fragments originally would have appeared, but it requires a lot of prior knowledge and often detailed research into specific parallels to be able to determine the original use of horse-gear fragment or wagon decoration – let alone visualize it. I wanted to do justice to the spectacular nature of the grave goods offered to the deceased, even if small fragments of these exceptional items were all that was interred. What I needed were reconstructions of what the Dutch and Belgian fragments originally looked like. Given the number of different kinds of surviving elements and different burials, I needed over a dozen different reconstructions. Which is where Iz comes in. She (among other medias) paints in Photoshop, which means that she can digitally paint in different ‘layers’. 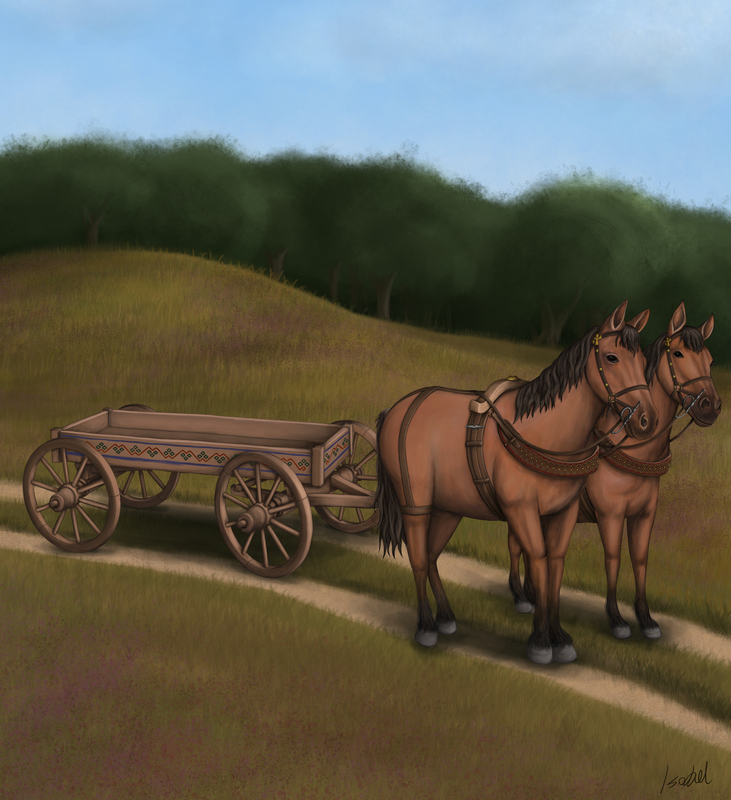 For the reconstructions of the horse-gear and wagons, she first painted a basic wooden wagon, yoke and horses that serve as a background for each reconstruction. Then she painted surviving metal elements found in each graves in their appropriate use-location. This means that I can ‘turn on and off’ the various metal elements to create a reconstruction of a specific complex of metal fragments – as they would have appeared in life. This process forced me to think in detail exactly how the metal elements could have been incorporated (and I stress the could as while we have a good idea on the use of these elements, each case does involve a certain amount of speculation). Iz would ask me exactly how a certain leather elements connected, and I would have to try and figure out the most likely scenario – taking into account both what we know from archaeological parallels, other reconstructions and the actual usability of the horse-gear and wagon reconstructed. As with reconstructing the Chieftain and his funerary urn with Raf, this led to very interesting discussions and forced me to think about things I had not yet focused on. Not only did this result in a series of illustrations that show the use of these items, they also help to bring them alive for those studying them today. 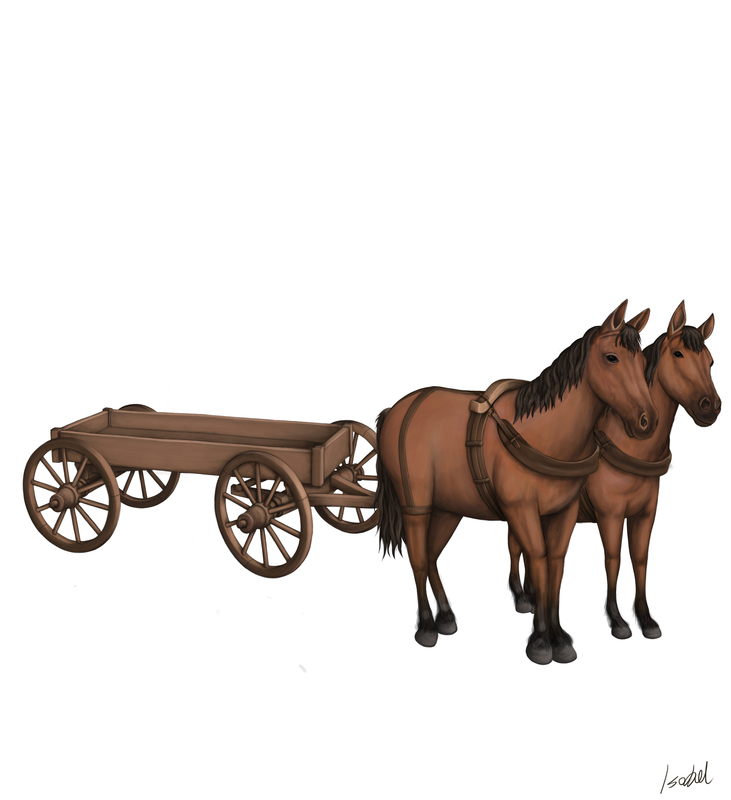 We also decided to recreate one of the manners in which we think these wagons were likely used – namely to bring the body of the deceased to his or her funeral pyre. We decided to focus on the Oss Chieftain, and she painted a shrouded body accompanied but the exceptional sword which was bent round in interred with the Chieftain’s cremated remains, and the bronze vessel which would be used as his funerary urn. In the background she painted one of the barrows of the Oss cemetery where the Chieftain would be laid to rest. In short – both Raf with his paints and Iz with her digital pen helped to bring a dead man alive in our imaginations. Note that while I refer to the man who was buried in this grave as ‘the Chieftain’ this is a historically evolved name, rather than a designation of his role in life.